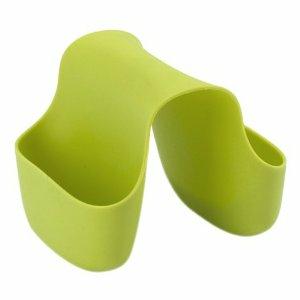 Keep kitchen sponges and scrubbers clean and contained with the handy Saddle caddy from Umbra. The caddy's two pockets securely straddle most standard kitchen double-sinks, keeping counter and behind-the-sink space clean and clear, and giving your sponge the opportunity to dry out between uses. Constructed of easy-to-clean molded rubber, it's available in a wide range of colors - from bright green to basic black - that make a statement or blend right in. This unit measures 4 x 4 x 5 inches, and is also available in a larger size. Coordinate your look with other molded-rubber kitchen accessories from Umbra. Designed by Ross + Doell for Umbra - the worldwide leader in casual, contemporary, affordable design for the home.